Ten metre high waves have been recorded off the north Cornwall coast by scientists monitoring the potential of renewable energy. 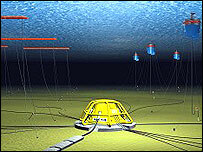 The news has raised expectations of a Wave Hub on the sea floor, sending electricity to the national grid. The waves were recorded by a buoy secured to the seabed 12 miles off St Ives for the last three months. Renewable energy agency Regen SW will use the information to prove the suitability of the site for a Wave Hub. A Wave Hub which will act as an offshore electrical "socket" connected to the national grid by an underwater cable. The South West Regional Development Agency (SWRDA) says a Wave Hub off the Cornish coast could generate electricity for 14,000 homes and create about 700 jobs by 2020. Warning notices to mariners are in place to protect the energy buoy as it measures the height of the waves. It will remain anchored to the seabed for the next nine months.